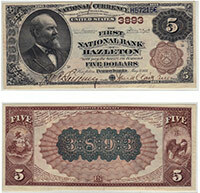 This is the last great white whale of national bank note collecting still waiting to be harpooned for the first time. We know that tens of thousands of these were printed by large national banks throughout the country. However, as of today, no confirmed examples are known to exist. There are only the occasional rumors. One of these is definitely worth one million dollars or more. Needless to say, we would love to see one.